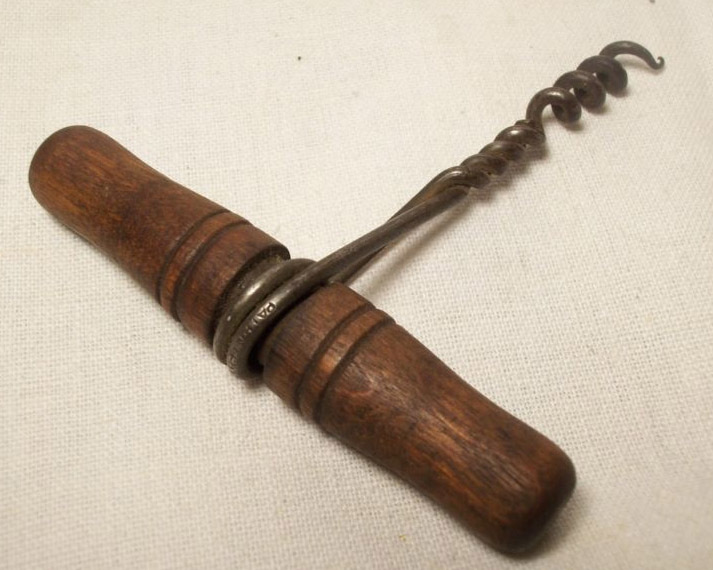 Recently I received an email from a someone trying to sell a corkscrew collection for their friend. Alway happy to help, I thought, as I emailed a request for pictures. I may actually go after a few others. I mean, what better addition to the collection given where we live than a collection of fish corkscrews. 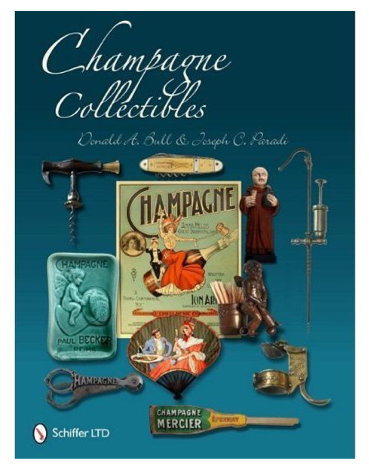 As mentioned the other day, Don Bull and Joe Paradi’s book Champagne Collectibles was due to arrive, and it is everything I had hoped for and then some. The photography is fantastic, and the breadth of champagne items that grace the 335 pages is astounding. It is a cork-popping book that deserves high praise. 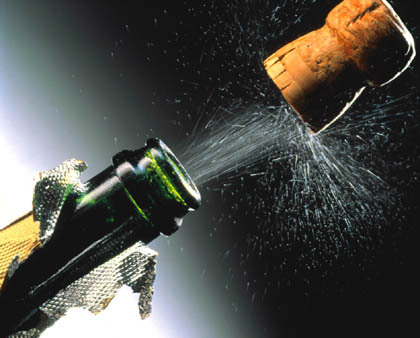 Don and Joe, we raise a glass to both of you and to Champagne Collectibles. While I will not be putting these two things together to create a foul tasting rust dissolving cocktail, I will be putting using a little naval jelly on the most recent acquisition. A lovely little bow corkscrew which is signed, ‘CHARLES HEIDSIECK CHAMPAGNE’ will soon be arriving on the island. With the corkscrew comes a fair amount of surface rust. And, I am thinking the Naval Jelly will solve (or dissolve) the offending oxidation problem. The corkscrew should clean up quite nicely, and will make for a nice addition to the bow corkscrew collection. BT and I were discussing a possible research project into Humason & Beckley (H & B MFG.) and the corkscrews they produced, while waiting for a field to open at Brimfield last week. And, since then, I have started digging around, and just yesterday received several photocopied pages from their 1900 catalog featuring their corkscrews (thanks BR!). However, I am sure there is more information out there. 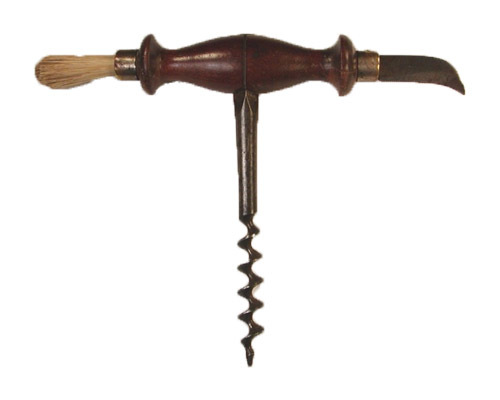 Do any of you have a Humason & Beckley catalog that features the corkscrews that they made? Any advertisements for their corkscrews? If so, it would be great if you are able to scan them and email them, or alternatively, make some copies and mail them to me. I will acknowledge those that contribute in the article when it gets published. 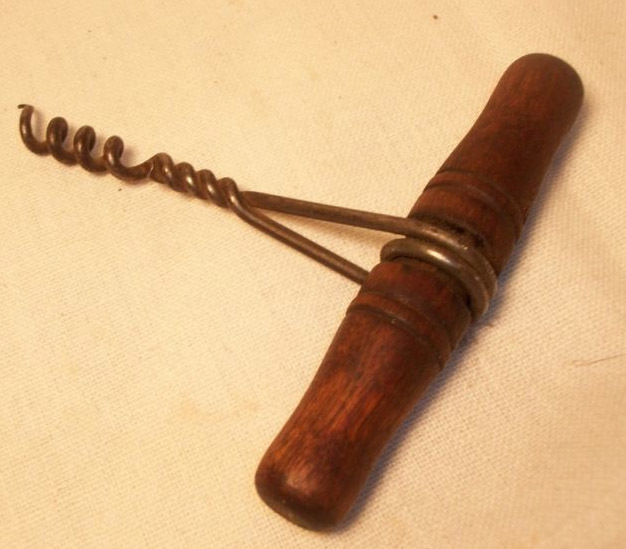 I will admit, that finding a Clough corkscrew isn’t that uncommon. However, with the exception of the Power Cone that I have in the collection, the only markings I have found on a regular Clough is when it had WILLIAMSON’S across the wires. And, I am aware that Clough’s with the patent date exist, but in looking at all the Clough’s that I have in my collection, and all the Clough’s that I have picked up in 12 years of hunting around estate sales, antique shows, and similar, that didn’t make it into the collection, I had yet to find one. As of the other day, however, a Clough direct pull with the patent date will finally make it into the collection. For those of you hoping I would be blogging about finding some rarity for a song, like RL’s recent 69.99 BIN of a Coney, perhaps tomorrow or the next day. 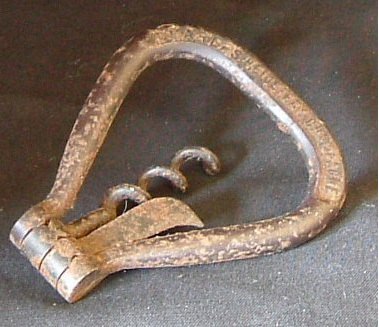 But, for now, I will relish the uncommon common Clough corkscrew–signed PATENTED FEB, 1 1876. Brimfield Updates and hightailing it home. This morning, at the appointed time, I arrived back at the fields of Brimfield. May’s opened today, and the field was quickly ravaged by the various corkscrew collectors that were about. I didn’t really pick up any corkscrews today, as I had already had a clandestine meeting planned with a vendor that possesses a corkscrew collection with which they wanted to part. I checked the time, and after checking the various booths, headed over to our predetermined meeting spot. The seller, had a partner that was due to arrive by 11:00 am with corkscrews in tow, but I had to depart at that same time to ensure that I would make the final boat heading to the island. As the minutes clicked by, rapidly approaching the witching hour, we discussed the hundred corkscrews that he had, and how instead of my buying a few of them, that he would prefer that he simply give ALL of them to me to sell for him. And so, over a handshake and a doughnut, a commission was agreed upon, and on Tuesday–as his partner got stuck in traffic, and I had to get to the boat–the corkscrews will be sent to me via an undisclosed carrier. 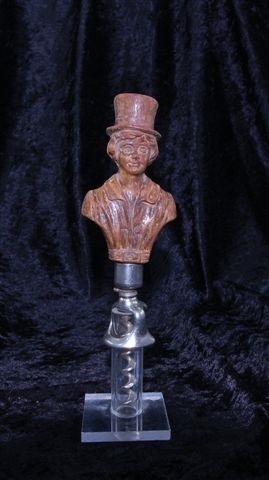 Having seen a portion of his collection in the past, there will be some fabulous corkscrews available. And, I will post pictures here when they arrive. 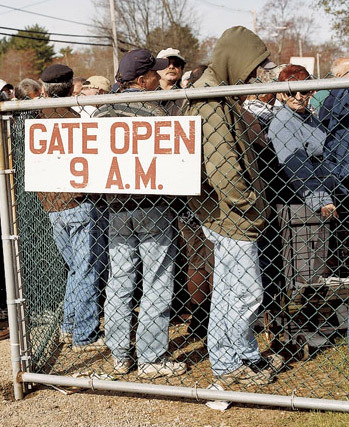 It would seem, a slow July Brimfield Antique Show, might indeed prove to be quite a great show after all. Thus far, Brimfield has been hot. On day one, we had 90+ degree temperatures, and 90 million + percent humidity. On the corkscrew front, pickings have been slim. And, over the course of day one, and day two, at various points during the sweaty hours of traipsing around the fields, whether it was BT, KC, or RC, when we would meet up, we would compare notes; Nothing to buy, nothing worth buying, etc. Still, we are all showing up for day three tomorrow, and hopefully there will be some great find to be found. This is not to say, that I haven’t bought corkscrews. I have!, just nothing terribly noteworthy. I will post pictures of the Brimfield-booty tomorrow. After one more cup of coffee, and a boat ride, this morning I will again make my pilgrimage to the Brimfield Antiques Show. July is often said to be the least attended of the three shows (May, July, September) by both dealers and buyers alike. Still, my first ever Brimfield show was only one day in July–several years ago–and those few hours hunting, netted our a dozen or so corkscrews, several of which stayed in the collection. What will it be this time. A signed Singleton bow? A Dickson patent? Could there be a Dudley or Chippendale? Might a Chinnock roundlet be unearthed, or a McLean patent? Might there be a new patent discovered? The mind simply races! I will provide updates and pictures from each day’s hunt. Stay tuned!!! After digging a little deeper, I ran across a George L. Hart, who has several of his patents for cutlery assigned to our man James D. Frary. And, after even a little more digging, I found that George L. Hart was awarded a patent for his metal rolling machine–which would allow him to make…. could this be the patent for Hart’s Patent ALL Steel Cork Screw??? I will continue the hunt.